Sooooo I created these cards and totally forgot to post them. How on earth did that een happen??? I’m usually so excited to share things that I have to stop myself from posting 5 times a day lol. I just happened to spot them when I was scrolling my Instagram feed and boom there they were like little lost orphans : ( So today is the day for them, finally lol. I’ve been challenging myself to make some cards that art not quite as poofy so they are easier to mail in a regular envelope. This is so hard for me with all the pretties at hand that I want to attach. This is a good compromise though……just enough without being too much. More washi and handcrafted flowers with pretty brad centers. 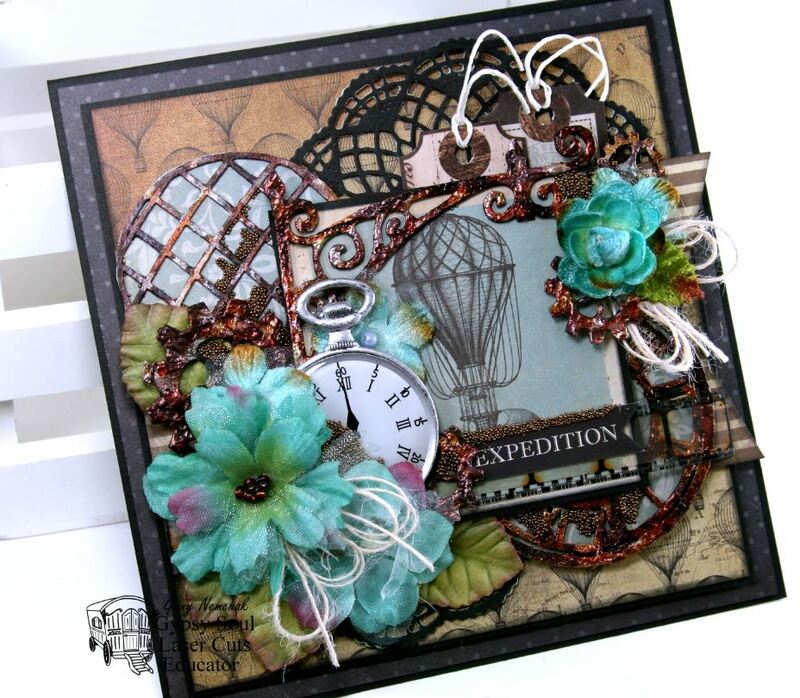 The kraft doily looks amazing with the black borders and tiffany blue and gold stripe tape. I am super in love with this bicycle tag!!!! 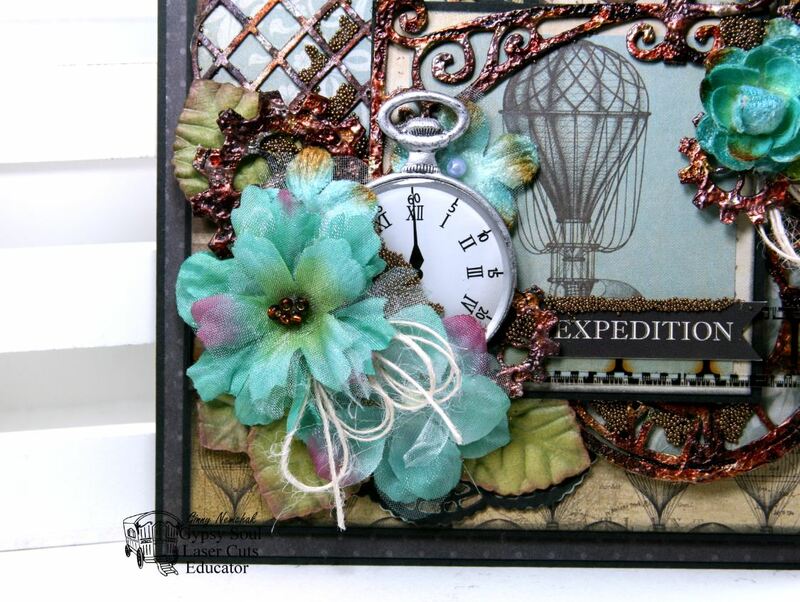 Also I added a layer of vintagy washi tape to act as a border…..and it matches perfectly to this Carta Bella paper. Vintage train tag??? Don’t mind if I do! These polka dotty flowers are coordinating so perfectly! It’s a little bit masculine…..but still having a lot of detail. The best thing about these beauties aside from the fact that fit nicely in an envelope….they are really great for any occasion. These cards are all available in the shop. It’s party time Paper Peeps! 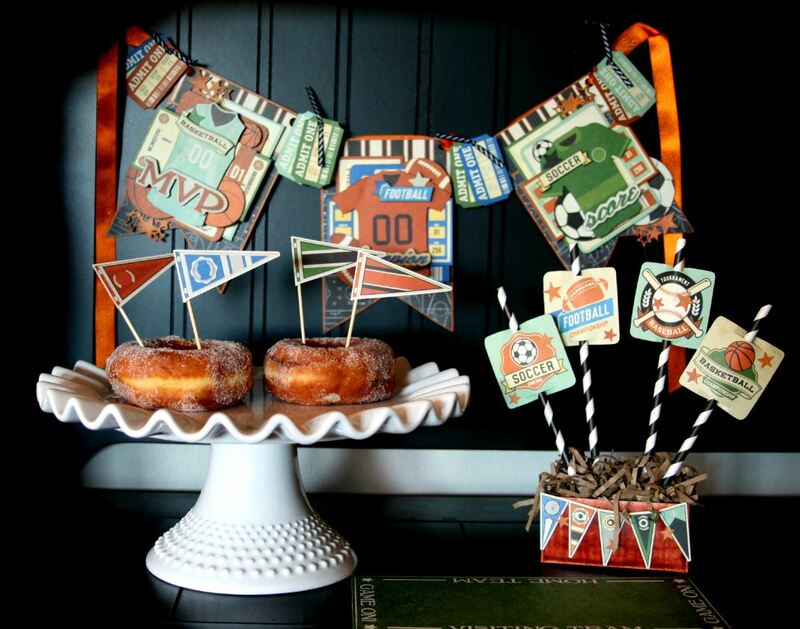 I’ve got a fun selection of sport themed party décor created with the new Game On collection. 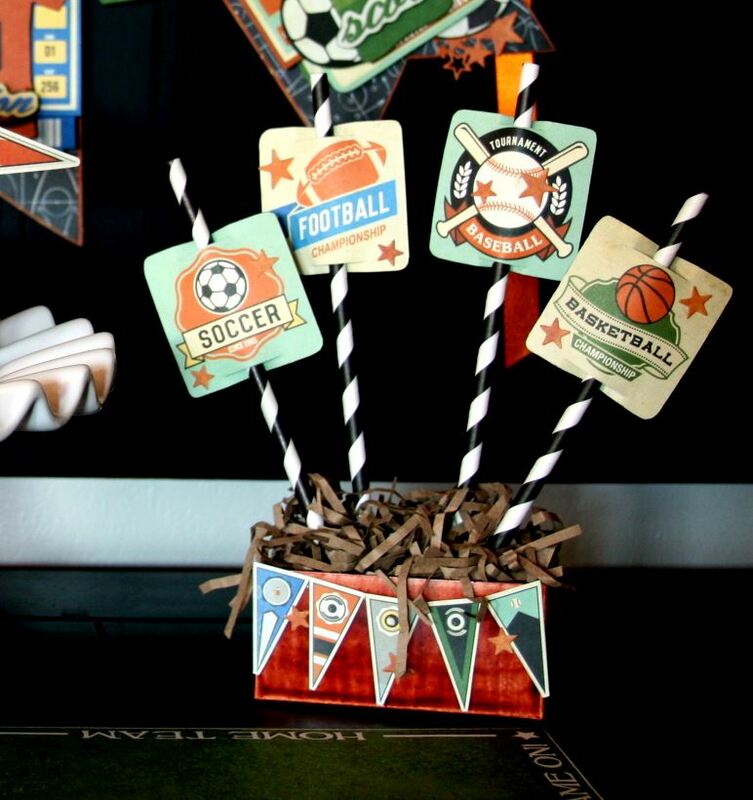 There’s a festive banner with multiple sports represented, pennant picks to dress up baked goodies, and jazzed up straws in a box decorated with a banner and crinkle cut filler. Isn’t this a fun grouping? I love all the little coordinating details. I used the Lasur Gel Stain in Chestnut to add color to a tiny box that came in the mail with washi tape. Because the box was shiny the finish has a mottled effect that looks a bit like wood grain. I filled it with floral foam and added crinkle cut kraft paper then inserted the straws that were decorated with a sport tag simply by cutting notches on the top and bottom and sliding the straw through. Additional stars are used to accent the tags. 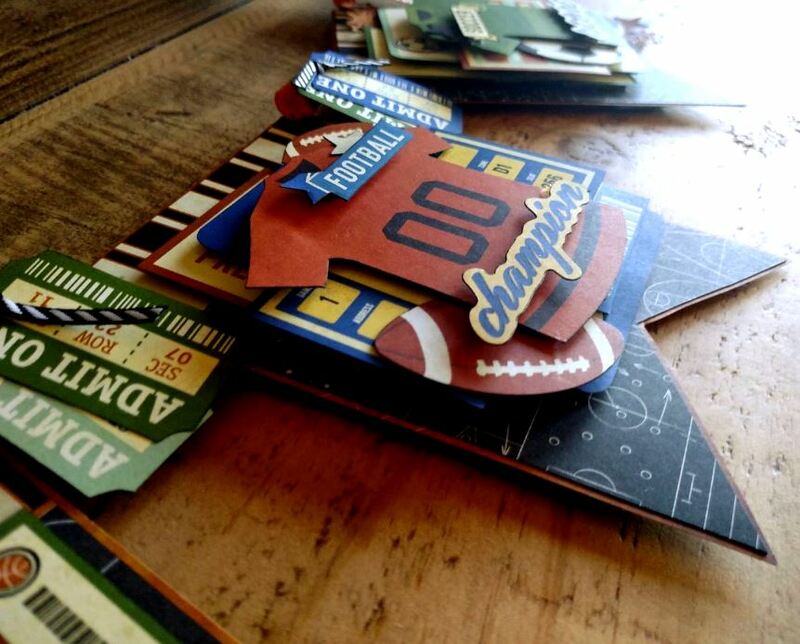 They were leftovers from the die cuts that are added to the banner. This display would make a great centerpiece. 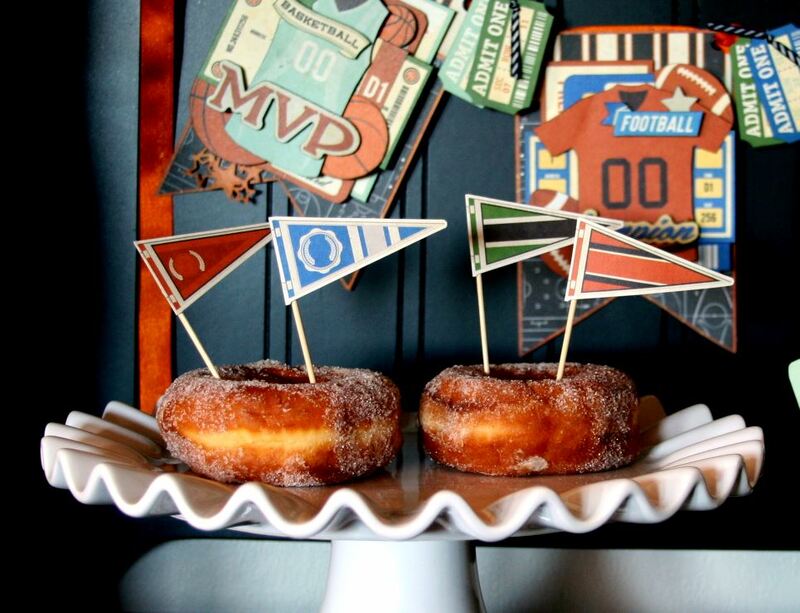 Can’t get any easier than adding pennants to long wooden picks and inserting them into baked treats. 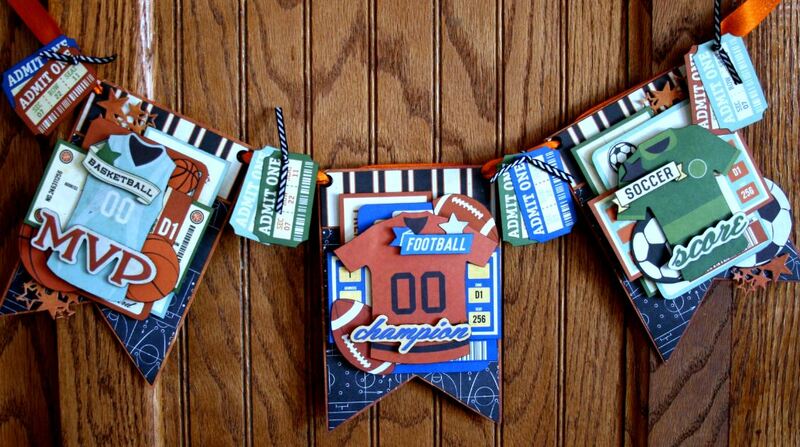 I choose to represent all the sports for this banner with a section for each and strung them together with coordinating ribbon and fussy cut tickets hung between. 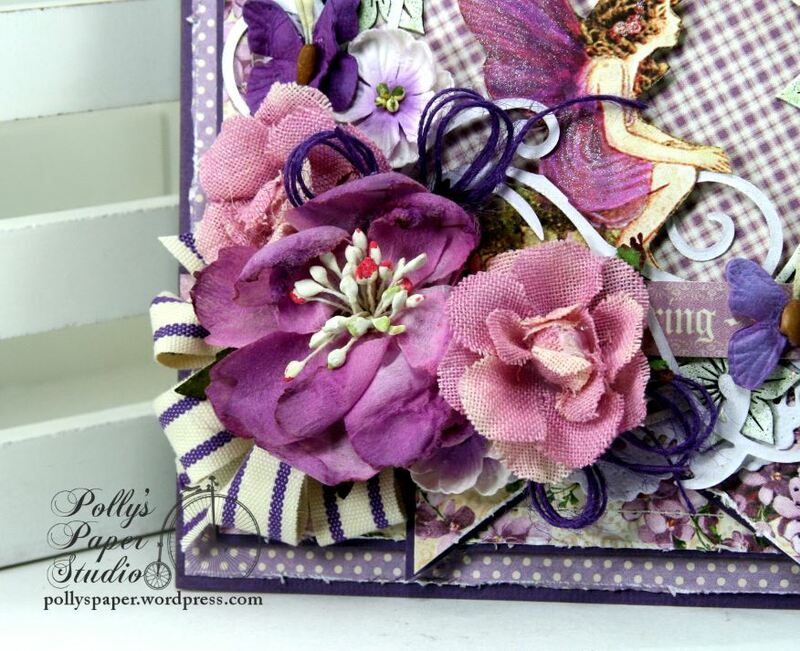 For a consistent look I used the same background paper and striped topper. Orange borders tie the whole thing together. It’s very important to remember to use metal eyelets at the tops of banner to keep the ribbons from pulling through. Adding the die cut stars helps to add texture and detail. Soooo many layers! 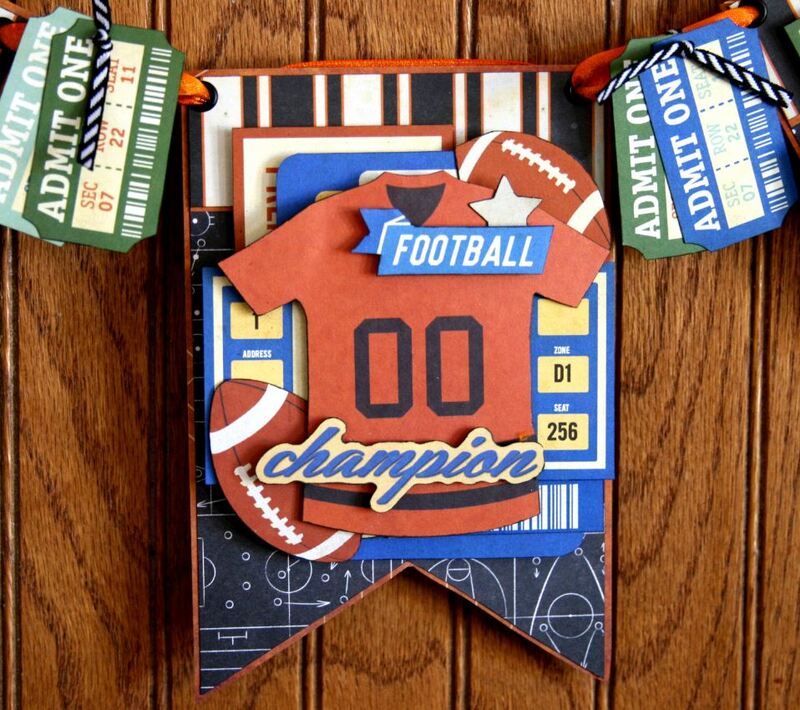 These banner sections have a lot of depth and dimension with the spacers between the layers. Hey there Paper Peeps! I know I have thoughts of Spring as it’s been a long cold Winter. I created this card with bright cheerful colors, and a gorgeous selection of flowers. 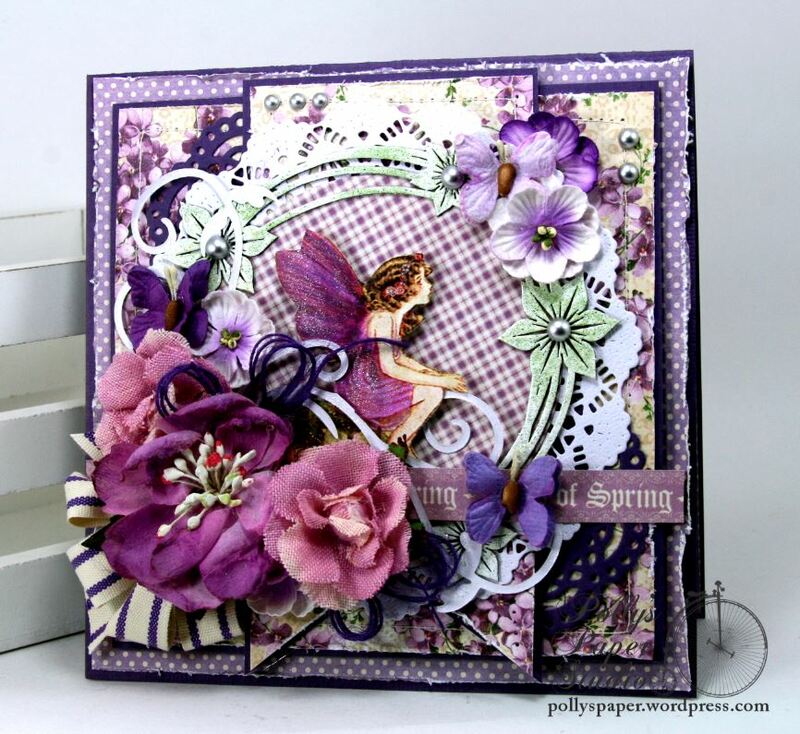 I’ve chosen shades of purple for this card inspired by the gorgeous flowers. Sadly I am not a very good gardener so all my flowers have to be Petaloo. Oh my goodness there is so much texture here!!!! 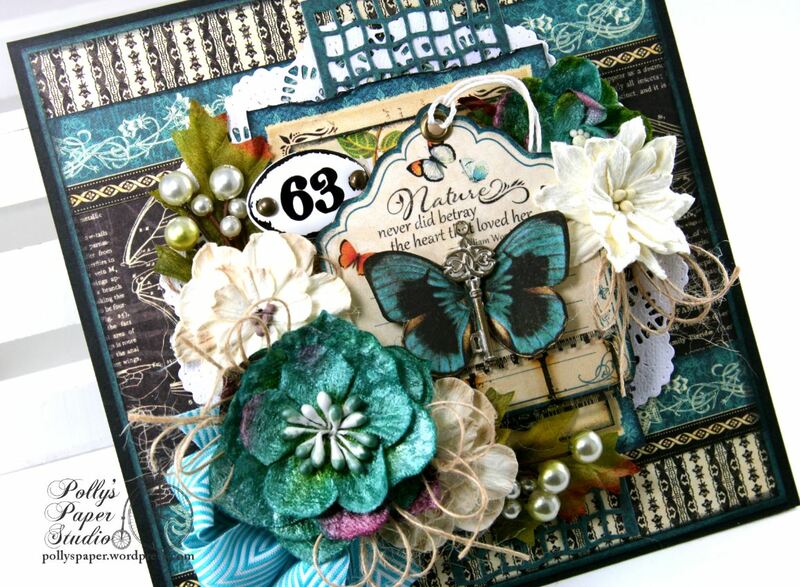 I’ve layered many types of flowers here and tucked in ribbon and twine and coordinating butterflies. 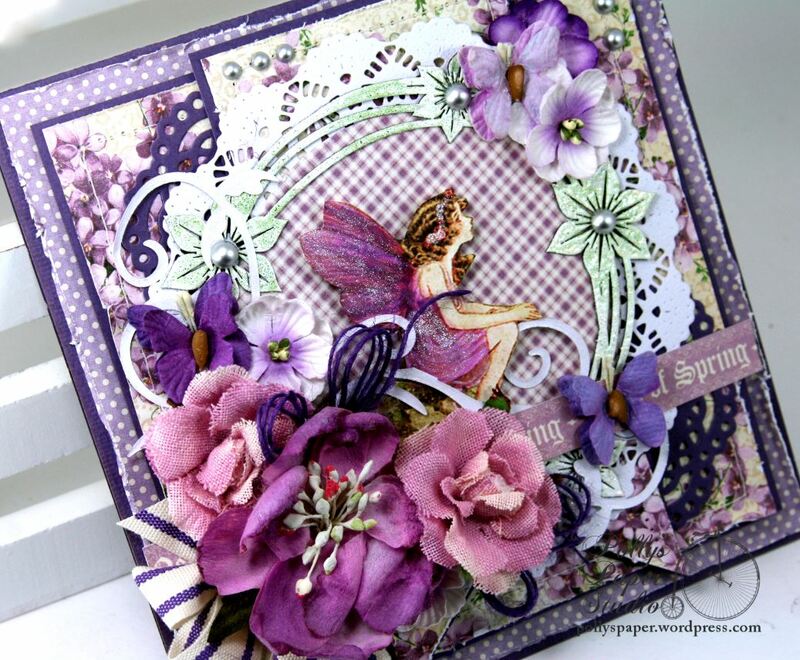 I’ve tucked in some altered chipboard and die cuts to enhance the floral theme. 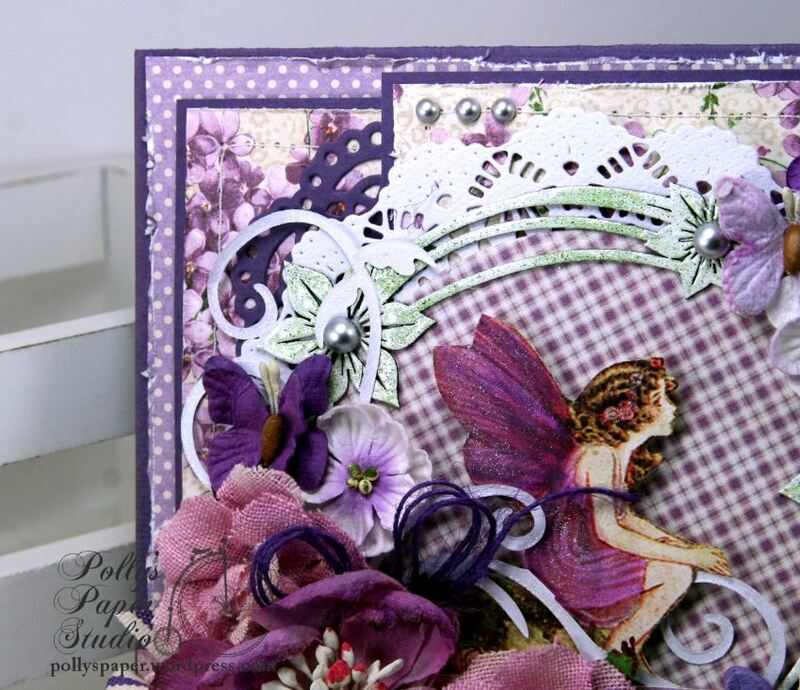 These colors are bright and the patterns are busy so I used a solid purple cardstock to act as borders. Additional flowers and butterfly here to balance the other arrangement. The paper has been tattered and stitched and I added pearly accents for detail. This paper from Graphic 45 was a nearly perfect match. I did alter the fairy just by using watercolor pencils and sparkle pens to color her wings and dress. 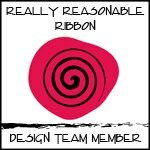 Really Reasonable Ribbon ~ Burlap String Violet. 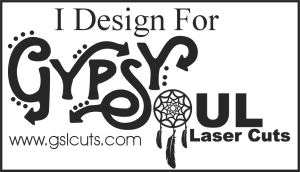 Gypsy Soul Laser Cuts~ Scribble Frame Hearts and Flowers. 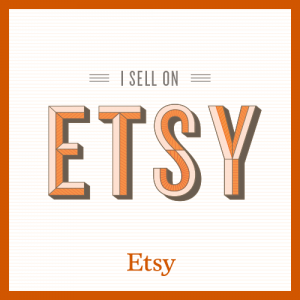 Cheery Lynn Designs~ French Pastry Doily, English Tea Party Doily. Hey there Peeps! Just dropping in today to share a project I created with gorgeous RRR trims and my new favorite collection Nature Sketchbook from Graphic 45. I’ve had a love for the chevron ribbon ever since I got my very first package from RRR. I mean…it goes with everything!!! The turquoise here matches the flowers perfectly. 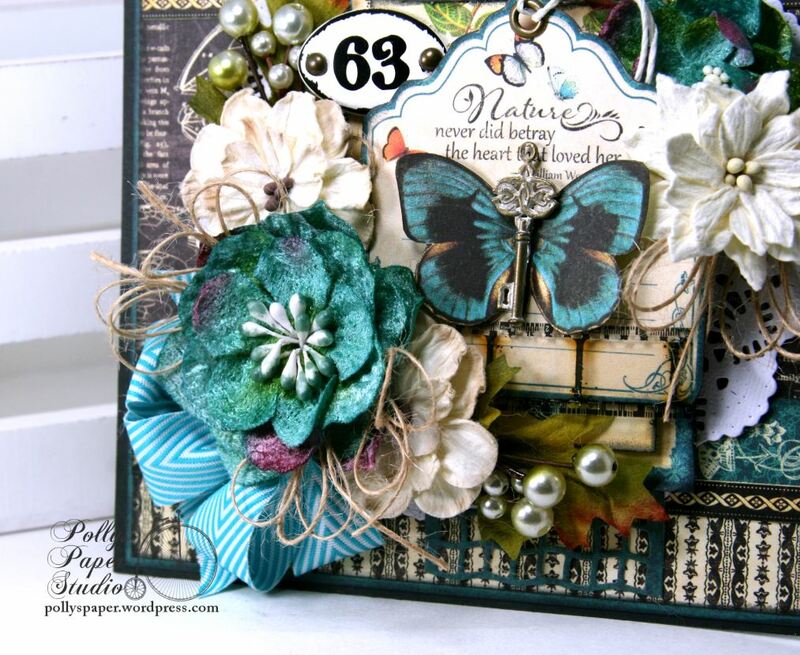 I’m using the Turquoise Chevron Striped Twill and Natural Burlap String for this card along with some fun embellishments and large dimensional flowers. 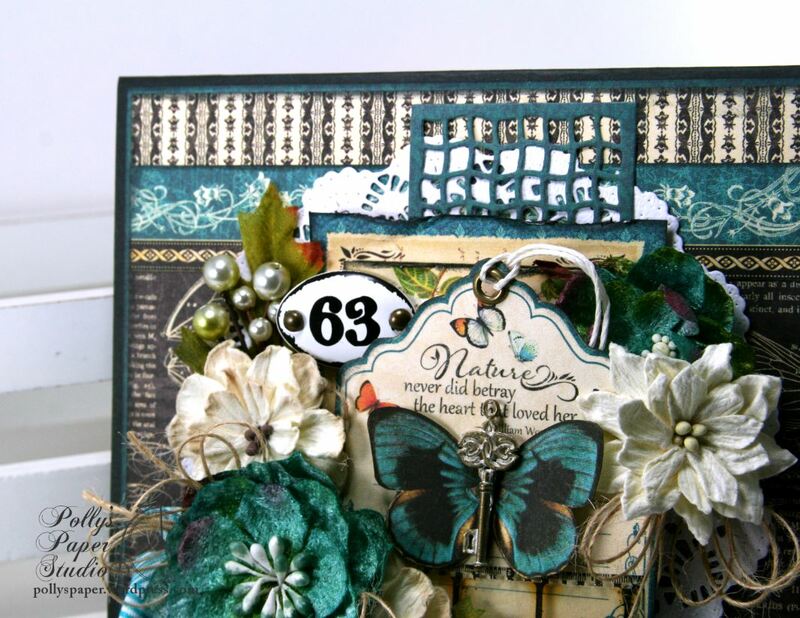 Graphic 45 ~ Nature Sketchbook, Metal Staples-Shabby Chic Metal Ornate Keys. 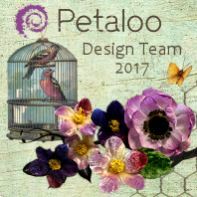 Petaloo~ Chantilly Collection – Mixed Blooms Flowers – Blue Green, DIY Paintables Collection – Floral Embellishments – Dahlias – Teastained Cream , Faux Dried Berry Cluster. Hey there and happy Tuesday! I’m just dropping in to share a super fabby banner I created for St Patrick’s Day. It has so many festive details and fun embellies! I’ve loaded this baby up with patterned papers, vintage images, tinsel trim, epoxy embellishments, lots of shamrocks with various finishes, ribbon, flowers, clip, rosettes, die cut doily, and wooden clothespins. She’s such a pretty little Irish lass. I topped her off with a lucky label created with my old school style Dymo. 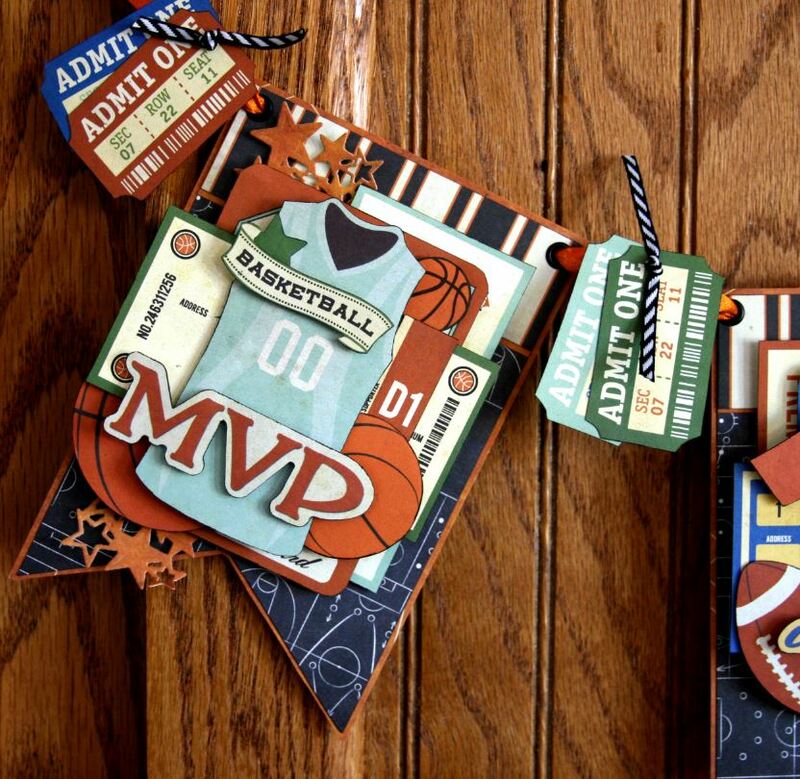 Ticket tags with poofy bows are strung on the ribbon trim to accent the large banner sections. There are a few kits available for this banner. If you want to check out the details head on over to St Patrick’s Day Banner Kit. Enjoy the rest of your day Peeps! Hey there Paper Peeps! 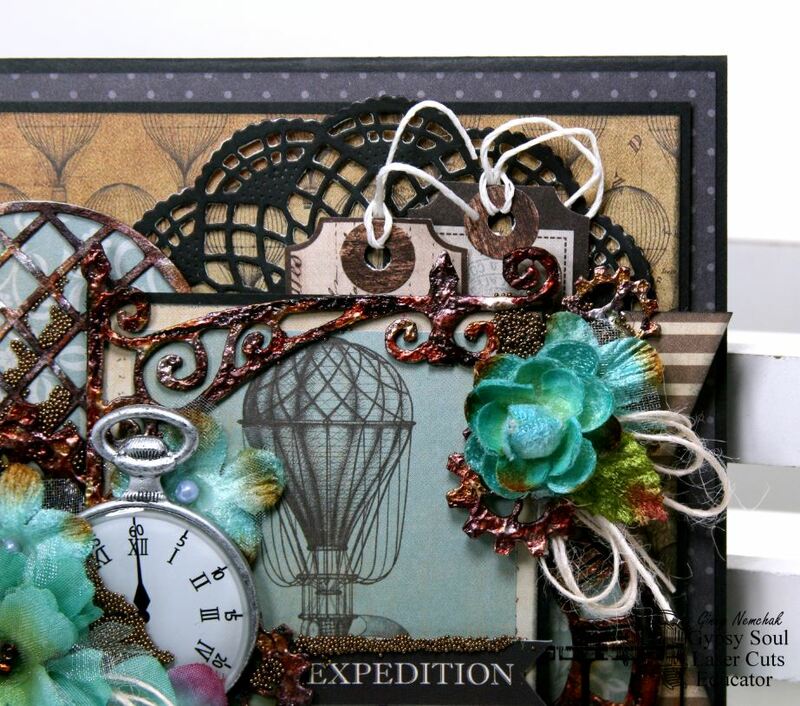 I’ve got a little steampunk inspiration coming your way inspired by some gorgeous masculine papers with hot air balloons. 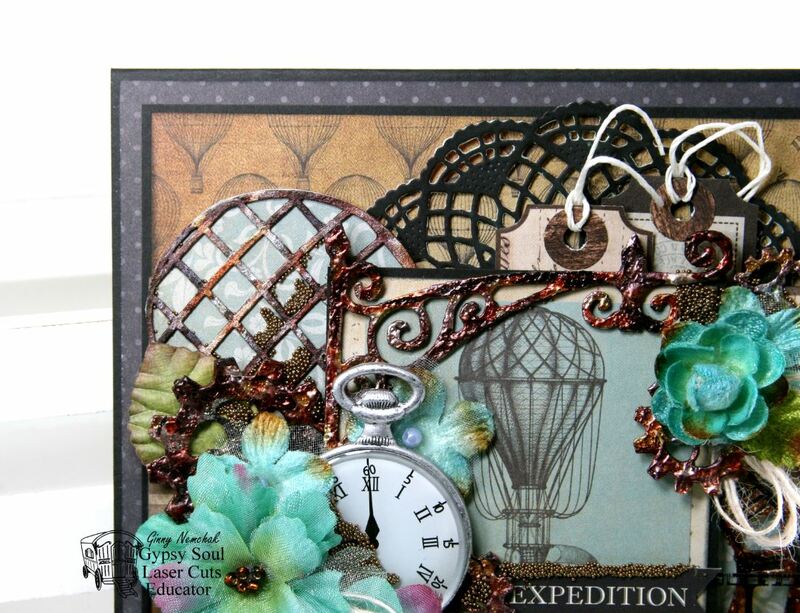 I pulled out some of my favorite steampunk chippies from Gypsy Soul Laser Cuts and loads of mixed media supplies and beautiful flowers. 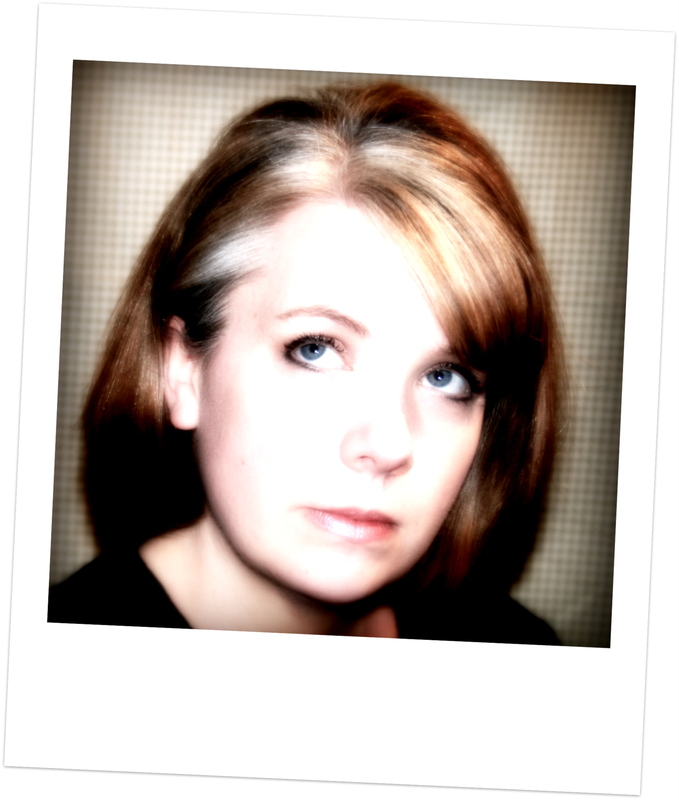 Here’s a look at how I altered the chippies…. 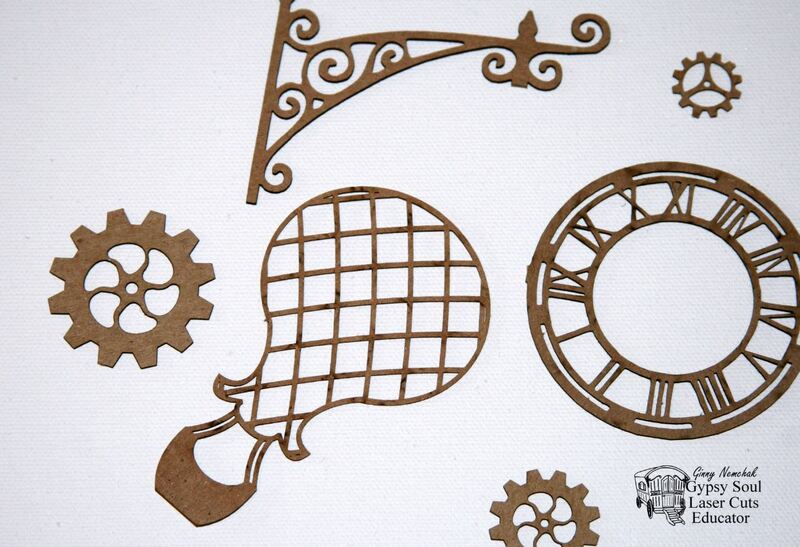 The most important thing is to select chipboard that will enhance your project. Even if I’m going to finish the chippies with dark colors I base coat them in flat white paint. 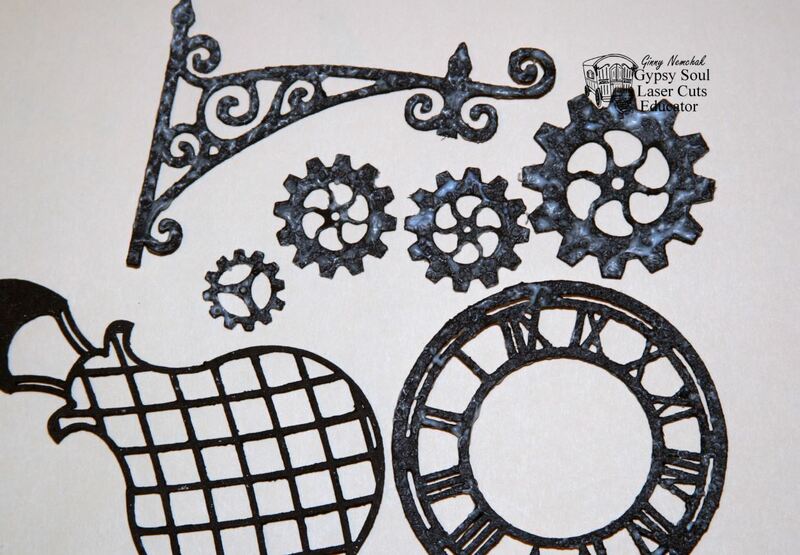 I used a very thick coat of Iron Paste from Pentart and allowed to dry. Next I globbed on 3D Matte Gel from art basics to add a lumpy bumpy texture, then heat set to encourage the bubbling. Using a cosmetic sponge I dabbed and smooshed on loads of alcohol inks. I finished up the card with flowers, micro beads and twine. 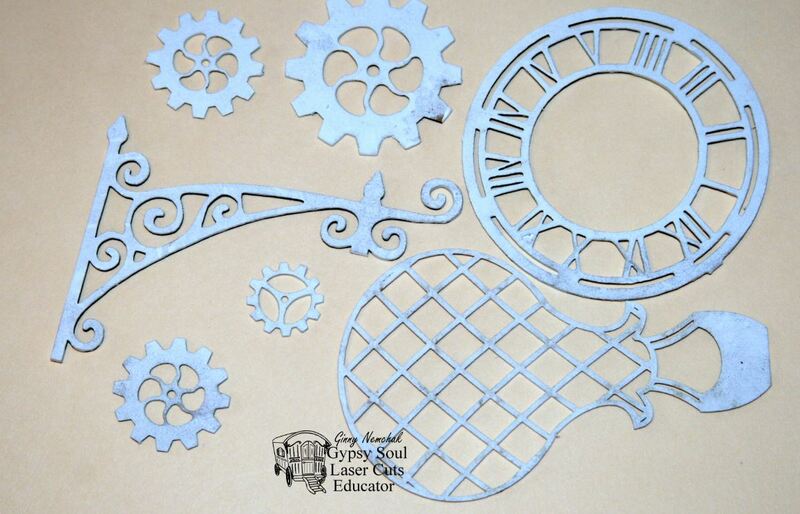 Gypsy Soul Laser Cuts~ Hot Air Balloons Net Style, Hanging Clock Set, Steampunk Shape Set. 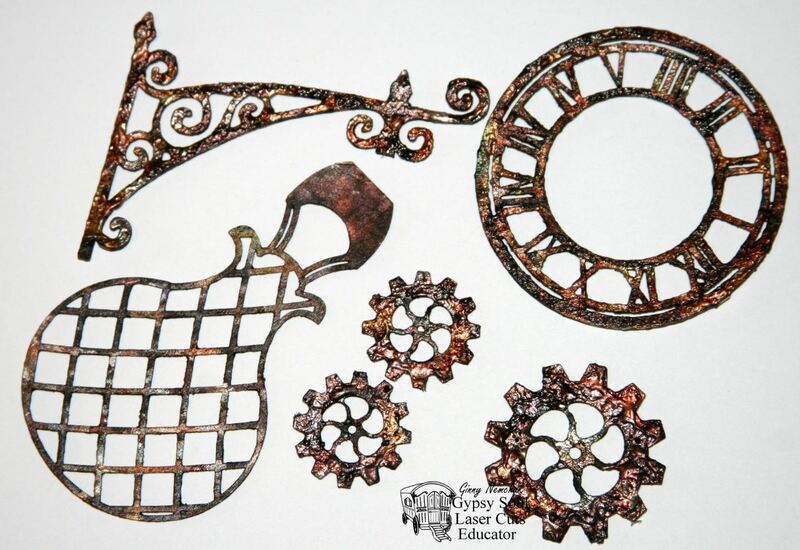 Additional Supplies used~ art basics -3D Matte Gel, Finnabair-Bronze Micro Beads, Pentart-Iron Paste, Ranger Adirondack -Pitch Black & Rust, Ranger Alcohol Ink-Butterscotch & Stream & Copper. Hey there BoBunny Peeps! 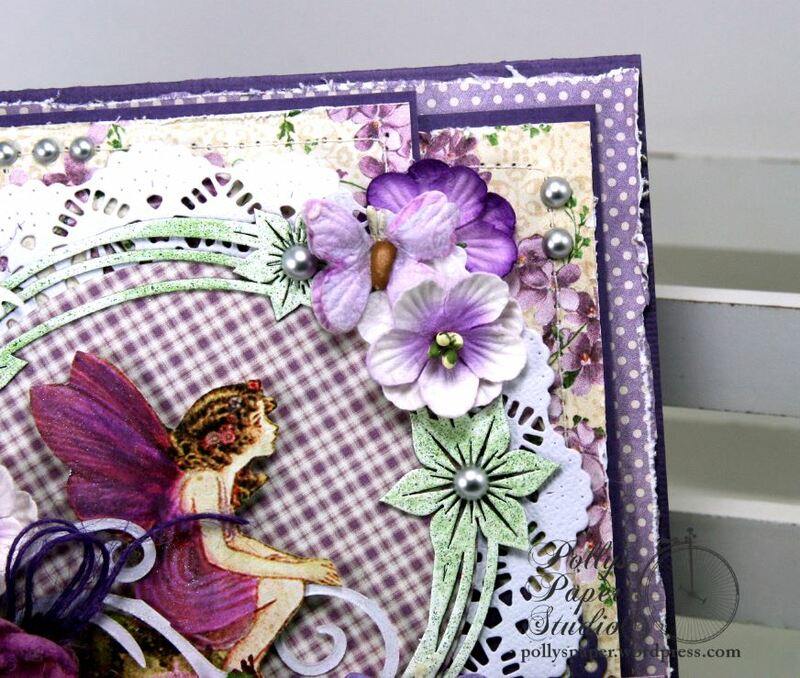 Today I’m taking a walk on the wild side with two cards created with the amazing new Make A Splash Collection. 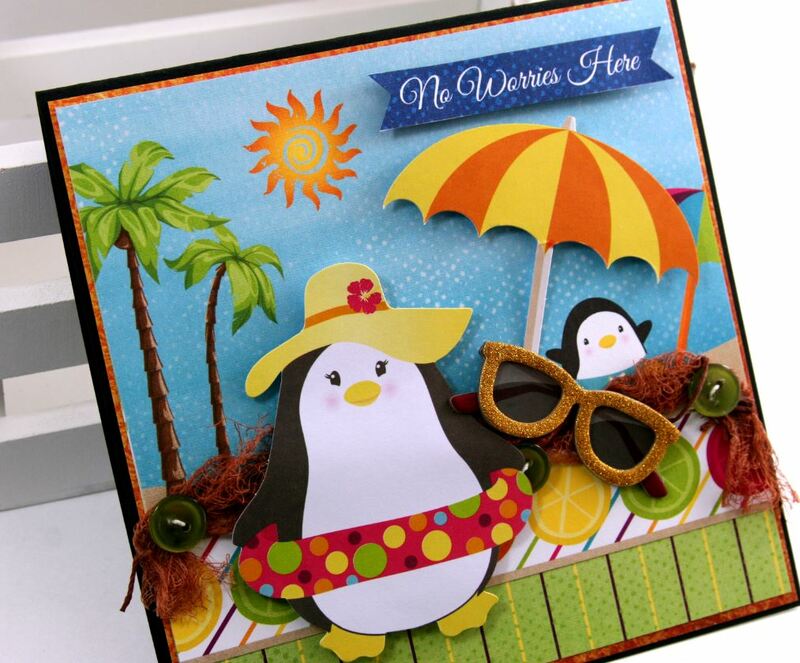 If you like bright colors, fun patterns and really adorable penguins….this is the collection for you. 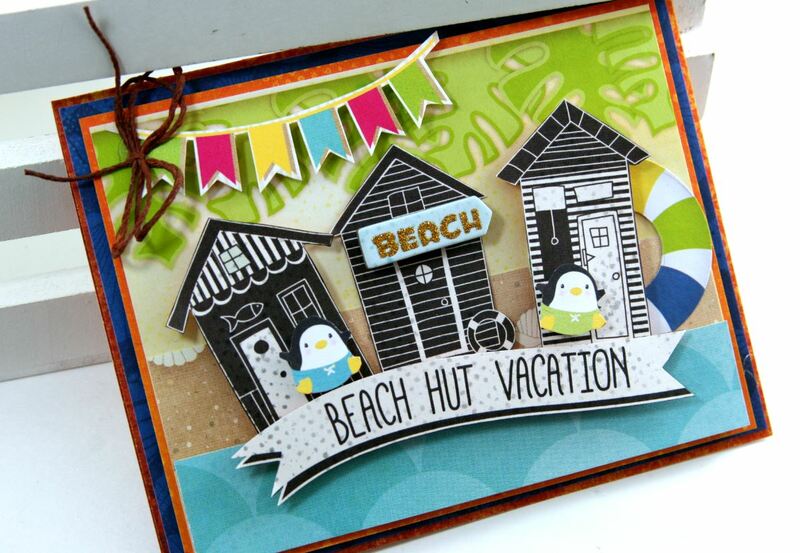 I totally want to go on a beach hut vacay with these little dudes! 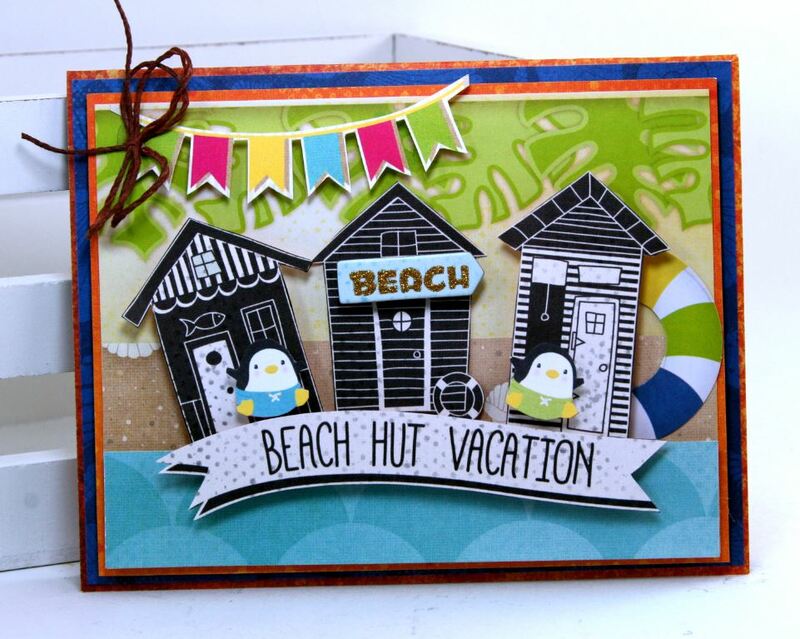 This card was inspired by the oh so cute little cabana houses that I fussy cut from the 12 x 12 patterned papers. 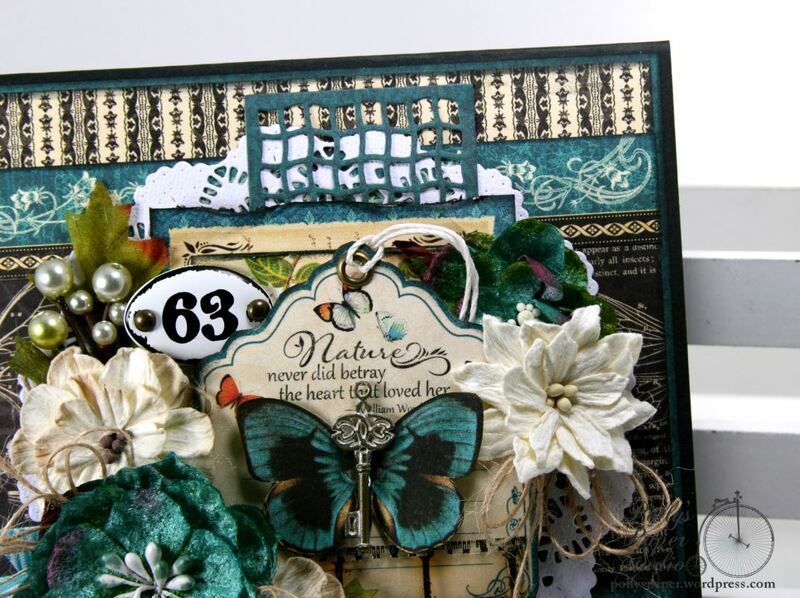 There’s elements from Noteworthy and the coordinating Layered Chipboard Stickers. 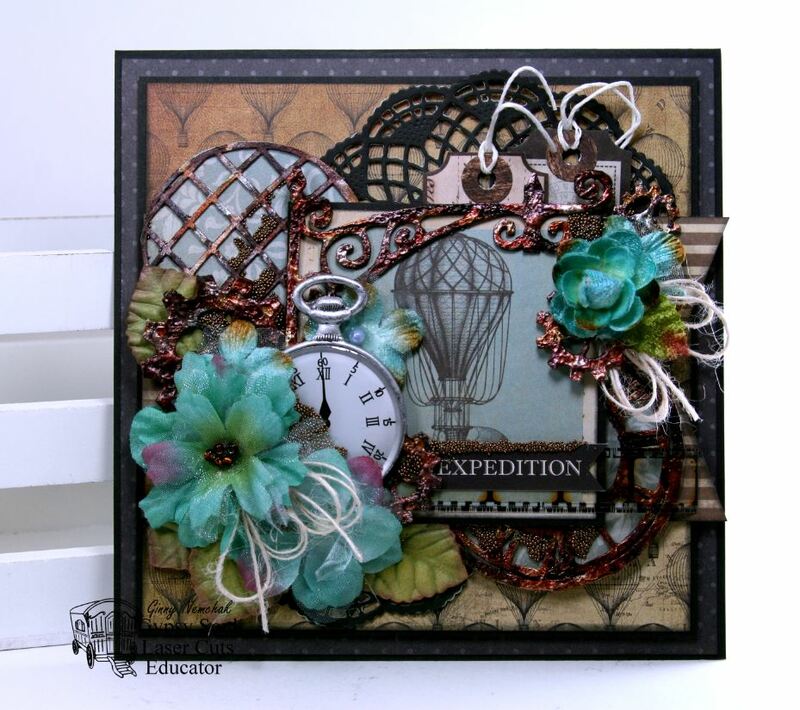 I used quite a lot of foam tape and spacers to give lots of dimension to this fun card. The banner on the top was a fussy cut element from the 12 x 12 cut apart sheet. What a great way to bring the color to the top of the card. The little twine bow was tinted with the Lasur Stain in Chestnut which gives it a more beachy feel. I used the same Lasur stain to color the cheesecloth for a faux fishnet effect. This card also has the super fabulous glitter sunglasses which are so cool and I want a pair for myself! I used hot glue to adhere the fishnet and to cover the goo globs I topped it off with coordinating buttons. This card just makes me all kinds of happy : ) Maybe it’s the sun and palm trees that we are lacking here this time of year in Michigan? I could definitely use some warm sand beach time right about now!!!!! 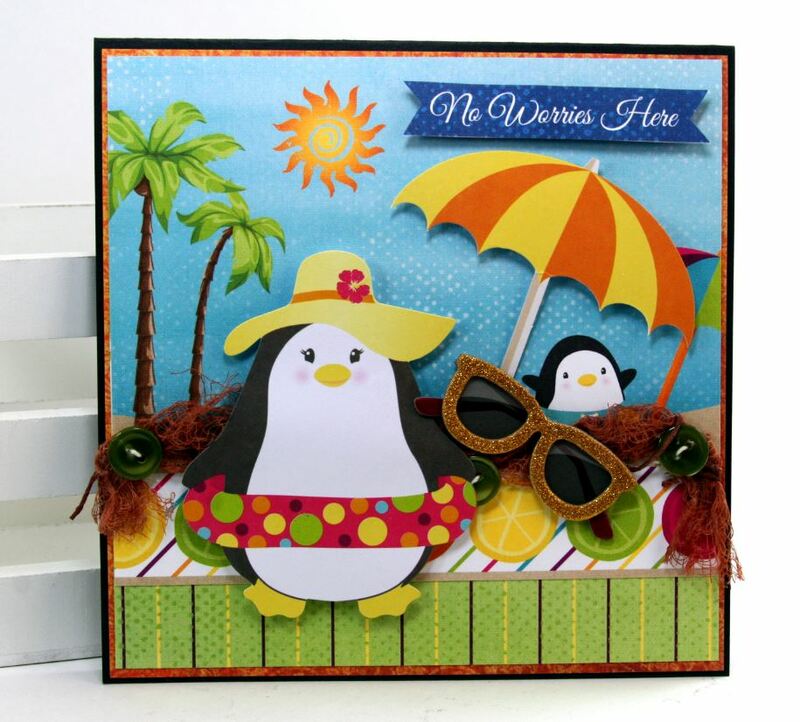 Please enjoy this tutorial I’ve prepared for you so you can make some fun in the sun cards for yourself with Make a Splash.